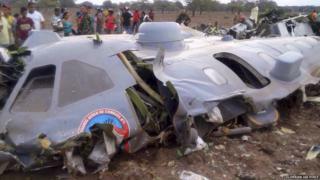 A Colombian air force plane has crashed in the north of the country, killing all 11 of those on board. The twin-engined CN235 transport plane came down in a rural area near the town of Codazzi, in Cesar province, having reported engine difficulties. Colombia's President Juan Manuel Santos described the victims as heroes. An investigation into the cause of the crash has been ordered, says the commander of Colombia's air force, Gen Carlos Bueno. Colombian media reported (in Spanish) that local residents said the plane had been struck by lightning. All of those killed were members of the Colombian air force. The CN235 is manufactured by Airbus, who said in a statement that the plane concerned was produced in 1998 in Seville.